Marinated in beer, garlic, and a rub of Creole seasoning, this grilled pork loin is ultra moist and loaded with flavor. If the weather isn't suitable for outdoor grilling, this pork loin can be oven roasted just as easily. This tasty recipe really livens up the flavor of the fish. Perfect as a side dish or even as a main course, this full-flavored salad will be a real hit. This taco salad recipe can be easily doubled. In this recipe, boneless, skinless chicken breasts are grilled, brushed with barbecue sauce, topped with sweet honey ham and melted provolone cheese, and are then placed on a slice of whole-grain bread and served as a tasty open-faced sandwich. 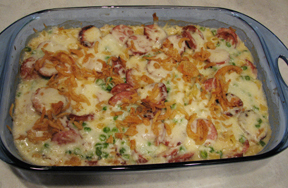 Something different for supper that even the kids will like. If you don't have time to make the Broccoli Slaw Salad, a nice tossed salad would go well with this pasta dish also. Tender meat with lots of flavor. For a quick vegetable to add to this meal, heat up some canned or frozen green beans. 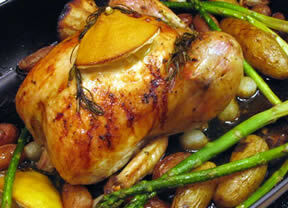 Using free-range chicken really does make a difference in this delicious recipe because it is so moist and tender. The caramelized vegetables add so much to this dish. This is a complete one-pan meal.